Cruisers should get their Fins Up, as Norwegian Cruise Line today announced the expansion of its exclusive partnership with Margaritaville®. As a part of The Norwegian Edge™, a $400 million investment program dedicated to delivering an exceptional onboard experience, Norwegian will introduce new Margaritaville® at Sea restaurants onboard Norwegian Getaway and Norwegian Breakaway this fall. Building on its success and popularity on board Norwegian’s newest ship, Norwegian Escape, Margaritaville® at Sea onboard Norwegian Getaway and Norwegian Breakaway will bring to life nostalgic island moments with a tropical menu that features signature items like the Cheeseburger in Paradise and Who’s to Blame Margarita, available à la carte, in an open air-eatery offering stunning ocean views. Margaritaville® at Sea will open September 18 aboard Norwegian Getaway in the former Flamingo Grill, and on October 9 aboard Norwegian Breakaway in the former Uptown Grill. Norwegian Breakaway revolutionized the cruise industry when she debuted in 2013 bringing the best of New York City to sea with industry first innovations like The Waterfront, a full deck promenade of restaurants, bars and lounge space which enhances the guests’ connection with the ocean; high energy Broadway entertainment with Rock of Ages and Burn The Floor; a wide variety of accommodations offerings and much more. Norwegian Breakaway sails from New York year-round, during the winter months offering seven-day sailings to the Bahamas and Florida as well as Caribbean sailings up to 14-days visiting some of the most sought after winter escapes, and seven-day sailings to Bermuda featuring three days in-port. Norwegian Getaway, sister-ship for Norwegian Breakaway, sets sail from her home city of Miami and embodies the essence of the Magic City, the ship’s hull artwork was designed by Miami’s own David “LEBO” Le Batard and offers 26 dining options, two Broadway Shows, a thrilling Aqua Park with five heart-pounding slides, Splash Academy for kids and much more. Now through April 2017 Norwegian Getaway will sail seven-day Western Caribbean itineraries with alternating ports of call including Costa Maya, Mexico; Roatan, Honduras; Harvest Caye, Belize, the Caribbean’s new premier resort-style port of call that is being developed by Norwegian and due to open in November; and much more. 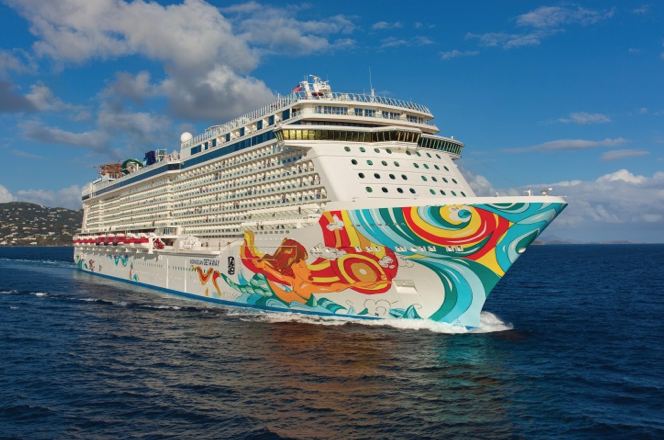 In Summer 2017, Norwegian Getaway will return to Europe for the first time since her delivery in 2014, and sail the Baltic Capitals from Copenhagen, giving guests the opportunity to experience the ultimate in freedom and flexibility on eight- or nine-day cruises. This spectacular itinerary will allow guests to explore UNESCO World Heritage sites, take in the picturesque Baltic countryside and experience the unique history, cultures and architecture of these famed European cities. The itinerary includes calls in Tallinn, Estonia; Helsinki, Finland; Stockholm, Sweden; Warnemünde, Germany which features shore excursion options to Berlin; along with an overnight in St. Petersburg, Russia.